Flat Earth | Flat Wrong: An Historical, Biblical and Scientific Analysis is the latest of Robert Sungenis’ intriguing works. Sparked by the recent and ongoing controversy in social media on whether the Earth is flat and covered by a dome, or is a spherical body surrounded by the vastness of space, Robert was commissioned by the Kolbe Center to write this book and show why, historically, biblically and scientifically, the globe Earth is the true reality. It is by far the most detailed and comprehensive exposé on the flat Earth theory ever written from the critical side of the debate. Its 736 pages are divided into three sections. The “Historical,” about 100 pages long, deals with the major personalities involved in the flat Earth movement, beginning from Rowbotham in the late 1880s to the leaders of the modern movement today – their motivations, their science, their funding, their worldview. It also reviews how modern science and modern theology have viewed Genesis 1 and how both have stumbled just as much as the flat-earthers in trying to understand both the creation story; the shape of the Earth, and the meaning of the Firmament. Included are the cultural and psychological causes and effects of both the flat Earth movement and the Big Bang cosmology of modern science. The Biblical section, which is about 200 pages long, goes into a deep and comprehensive exegesis of every passage that is relevant to the subject of a flat Earth v. globe Earth, including the popular passages such as Isaiah 40:22 (“the circle of the Earth”) and the passages dealing with the “four corners of the Earth.” The original Hebrew and Greek of each passage is thoroughly examined. 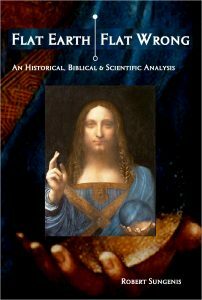 Special attention is paid to both the Church Fathers’ views on a spherical Earth, which covers 80 pages of analysis; as well as a thorough exegesis and applicability of the Firmament. It also presents, for the first time in current literature, the case for the dubious origin of the “dome” concept, which takes about 70 pages of analysis. Finally, the Scientific section, in 400 pages of detailed analysis, covers most of the arguments flat-earthers use to defend their model, including NASA and photos of the Earth, the Chicago skyline as seen from Lake Michigan, Antarctica and the ice wall, gravity and the vacuum of space, and 40 other topics. It is divided into astronomical-based evidence and Earth-based evidence.